Just look at this picture and tell me who is going to inherit this land? 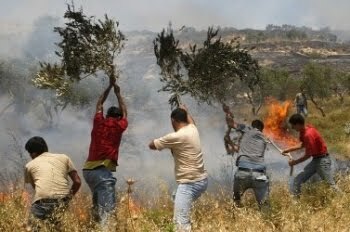 The Zionist terrorist settlers are literally burning Palestinians trees while your terrorist Zionist army watching you while committing your treacherous crimes. Since your colonized arrival to historic Palestine, you have created nightmare and so much destruction to this beautiful magnificent Palestine, and by the way who made this land bloom?, you are the filthiest of all filth ,we will never forget or forgive you of what you have done , your filthy criminal terrorist action will not be forgotten or forgiven by our people, you will be pay for your crimes, it is only a matter of time , when we put an end to your filth and treacherous criminal action , you will never be able to escape your crimes, and your coward army is not going come to your rescue.